In the English language, the term bonsai is often used loosely to reference all miniature-scale trees. But bonsai refers specifically to a Japanese art form, ascended from the Chinese art of penjing, more than a thousand years ago. Bonsai, like other forms of art, uses the medium of symbolism to communicate ideas and emotions. An understanding of Japanese aesthetics contributes to an appreciation of bonsai’s rich symbology. 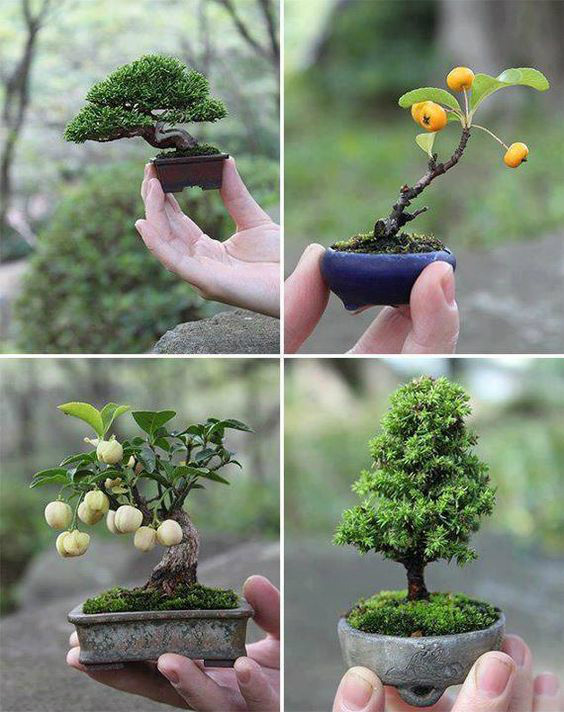 Bonsai utilizes horticultural techniques along with artistic applications to cultivate miniature replicas of trees as they’re found in nature. The tradition has been refined over the last millennium to reflect the aesthetic qualities found in nature through balance, simplicity and harmony. 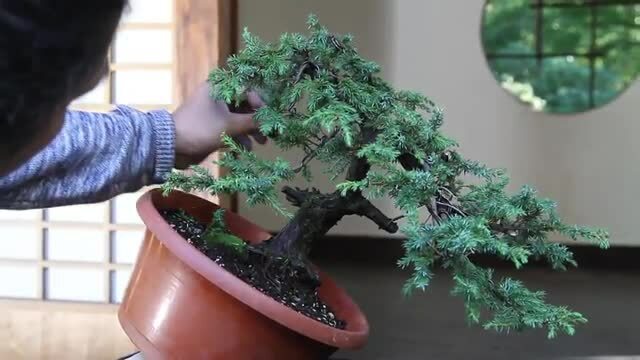 The aesthetic element of age is also predominantly symbolized in bonsai, utilizing various techniques applied to the design and cultivation of each creation by the artist. Symbolism is also employed to describe the relationship between the stylized bonsai and trees found in nature. Balance plays an essential role in bonsai aesthetics. The triangle, used in overall design, traditionally symbolizes strength and stability. Rather than following Western rules of symmetry by using equilateral triangles, bonsai incorporates the isosceles triangle. The isosceles, with its unequal sides, provides asymmetry. In Eastern art forms, such as painting, flower arranging and bonsai, asymmetry provides “sabi” or deliberate imperfection. This is interpreted as a more natural sense of balance and is highly valued in Japanese culture. While a triangle with even sides can appear passive and motionless, asymmetrical triangles provide a sense of movement within the composition of the design, symbolizing a continuation of life. Simplicity, which epitomizes Japanese sensibilities and profound respect for nature, can be found in Japanese architecture, fine art and home decor. In Japanese culture, less is more. Simplicity in bonsai is symbolized by the unadorned container which houses the showpiece. The color of the container, usually a neutral tone, also reflects the theme of simplicity found in nature. Bonsai’s predominant attention to principles of aesthetics means that the creation remains free of gratuitous ornamentation and maintains its position as the focal point. The aesthetic element of harmony is highly valued in Japanese culture and is evident throughout the composition. Bonsai’s understated elegance symbolizes Japanese philosophy that something with less power may have a greater effect. Careful attention to unity in shapes and textures contributes to the overall sense of harmony found in nature, which is the dominant theme in bonsai. Curves and fluid lines in the composition symbolize nature’s harmonious coexistence with other elements, while crooked corners and jagged edges represent difficult milestones. Age plays a significant role in the aesthetics of bonsai. Carefully manipulated characteristics of the tree’s roots, trunk and branches symbolize different stages of life, especially those marked by age. For instance, exposed roots give the appearance of erosion and age. Trunks that break the surface at an angle and continue with the tree growing in series of circles, produce the illusion of age, and symbolize triumph over the elements of nature. A trunk with a smooth texture and without blemishes impresses upon the viewer, a sense of youth and vitality. In contrast, scarred and gnarled trunks are symbolic of old age. A dead tree trunk placed strategically within the composition can symbolize the continuity of the tree’s evolution. Bonsai trained with thick lower drooping branches appear to be old, while branches that grow upward have the opposite effect by symbolizing the vigor of youth. Full and luscious growth also symbolizes the health vitality of a young tree. Sparse growth is used to support the other characteristics of age. 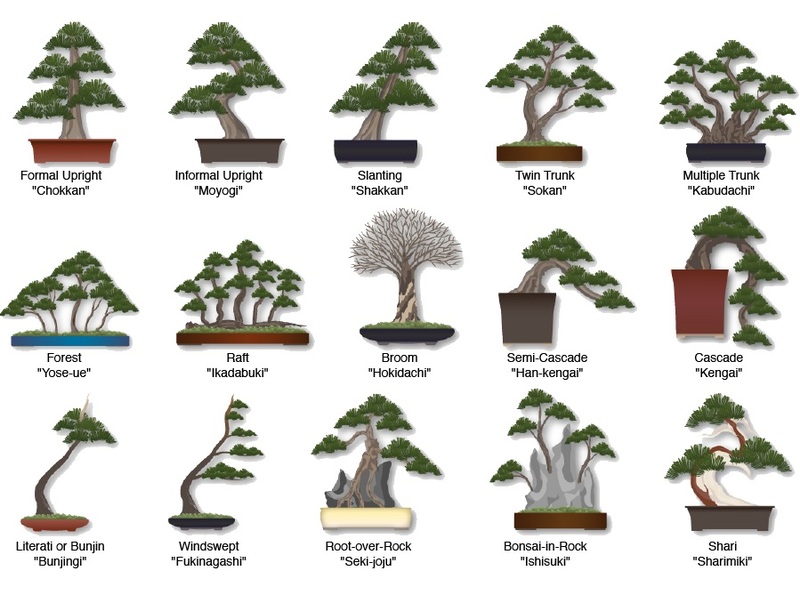 Bonsai are differentiated by styles and types, with each one represented in nature. The chokkan appears upright, with a straight trunk, symbolizing a healthy but isolated tree. The windswept appearance of the fukinagashi is representative of a tree continuously affected by strong winds, often found near the shore or on sparsely-populated plains. Cascading bonsai trees symbolize their full-size counterparts often found in nature growing on the sides of cliffs. The art of bonsai is robust with symbolism and meaning where everything means something. Each detail sends a subliminal message, contributing to the larger story encompassed within the ongoing creation. Container and accessory colors are carefully chosen to represent the hues found in nature. Twists and turns in branches symbolize age and the journey through time. The types of trees used are symbolically significant as well. Even bonsai displays are carefully choreographed to represent proportion and harmony. While some symbols appropriated to bonsai appeal to its mythic nature, much of the symbolism intends to communicate the aesthetics that make up the art of bonsai.